By the crossroads at the top of Westington Hill, where the road from Campden joins the top road between Moreton-in-Marsh and Broadway, stands a tall white post with four fingers pointing the way to four county towns. 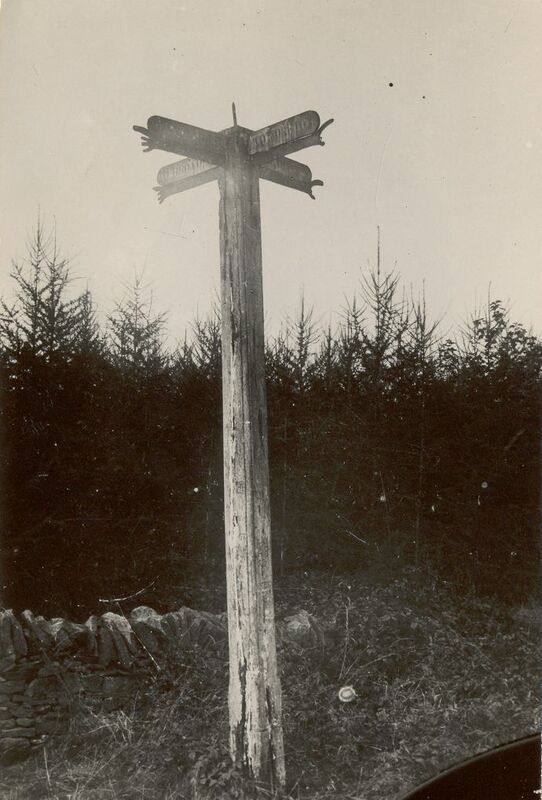 This old relic of the highway was an ancient fingerpost, unusually made from sheet iron, beaten into the form of four arms and hands, erected in 1669 to assist travellers. It is probably one of the oldest in England. Izods Post, also known as the Cross Hands (original now kept in Old Police Station, suspended from the Court Room ceiling) bears the inscription ‘NI 1669’ ‘Way to … Gloster XVIII, Oxford XXIII, Woster XVI, Warwick XV’. The letters NI on the post refer to either Nathan or Nicholas Izod, a Campden farming family, who paid for the sign’s erection. Nine generations and 350 years later there are still descendants of the Izod family living in the district and all over the world. There is however a problem as to which member of the Izod family of Campden should receive the credit. At that time there were two Nathan (or Nathaniel) Izods and two Nicholas Izods. A Nathan Izod was churchwarden in 1683/4, a Nicholas in 1646/8 and another was signatory to the accounts in 1686. Until recently one of the Nathans was thought most likely – it was a very popular name in that family. A member of the family who has researched its history thinks it more probable to have been a Nicholas Izod since all the Nathans were quite young in 1669. Thus, turning to Nicholas, one was born before 1600, was married to Mary Lysely (or Hysely) in 1621 and was churchwarden 1634/5 and 1641/8. Further records show that on 1st September 1666, a Nicholas Izod leased 2 messuages and 2 yardlands in Westington. His wife was Mary and their sons were Nathan and Nicholas. Is this the answer? Perhaps, but of course there may be more records yet awaiting discovery! It is said that a sheep stealer’s head used to be impaled on a spike at the top. The old post and iron fingers were deteriorating and in the 1980’s a reproduction post replaced the old one, which was given to the town for safe keeping. By the crossroads at the top of Westington Hill, where the road from Campden joins the high road between Moreton-in-Marsh and Broadway, stands a tall white post with four fingers pointing the way to four county towns. The present wooden post is a replacement, one in a long line, and nowadays so is the iron head. The signpost was there in 1675 when it was depicted by Ogilby in his route maps as a little shorter and sturdier than the present post. The iron pointing fingers still exist, rescued by CADHAS, displayed secure from weather, in the rafters of the Court Room in the Old Police Station in Chipping Campden High Street. This sign is made from sheet iron, beaten into the form of four arms and hands. The places and distances given on the fingers have occasioned some comment. Thus N. Izod was a remarkably good judge of distance after all! Percy Rushen’s History and Antiquities of Campden (1911) and The Churchwardens’ Accounts both have references to many Izods over the centuries from 17th to early 20th. During the period 1633/4 to 1717 the name ‘Nicholas Izod’ occurs on a number of occasions (so there must be more than one Nicholas), Francis Izod occurs in 1675. Henry Izod is found from 1636 to 1642/5. John Izod is a name that recurs between 1628/9 and 1710 (again more than one person). There is a Nathan Izod in 1683/4 and 1689. During the Civil War in about 1644 a ‘Mr Izoid’ is recorded as having supplied Metheglin (mead) to the church for use in Communion ‘when wine was scarce’. The name was occasionally spelt Izodd at that time. Amongst the leases listed by Rushen one dated 1st September 1666 mentions Nicholas Izod, his wife Mary and son Nathan. Another dated 10th May 1669 names John Izod, Nathan his son and Nathan his grandson. So, there were Izods in Campden at various times, sometimes two or three Izod families at the same time. Family names like William and Nathan seem to recur in each, so it is not always easy to attribute a record to one or another. The General Accounts of the Churchwardens of Chipping Campden 1626 to 1907 , transcribed by Leighton Bishop, Campden Record Series (1992).